Attention all Kodiak EQIP High Tunnel Owners, Current Applicants and Interested Parties! June 18 through September 10. This service is to answer questions, provide applications/documents/ forms and discusses objectives and protocols of participating in the NRCS Cost Share Program. Information about High Tunnels and other EQIP issues will also be available during these hours. There will be a Technical Service Provider (TSP) on hand. Time & Date: Wednesday July 2 from 9 am – 12 pm. * The TSP will meet with anyone during these hours on a first come first serve basis. Please do not call KSWCD during these hours. 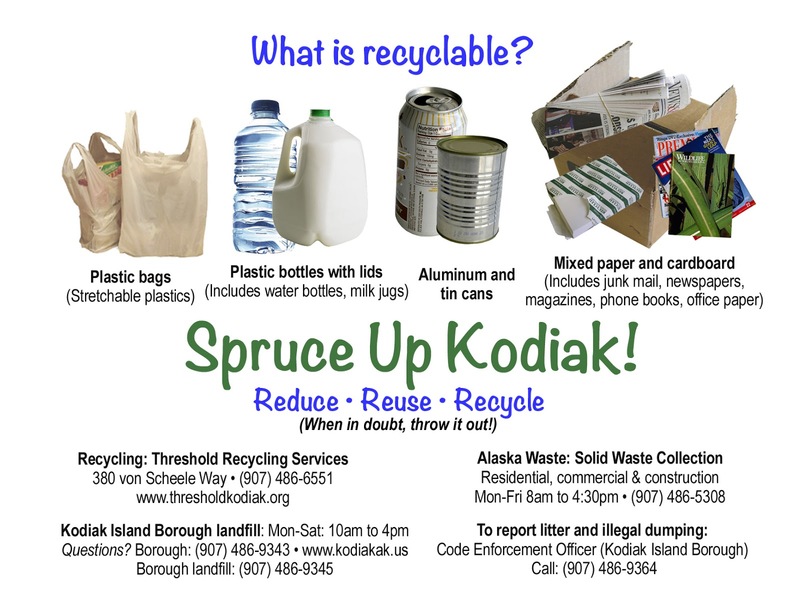 Last month, in an effort to increase education and outreach to the Kodiak community regarding solid waste issues, recycling and more, the Kodiak Island Borough's Solid Waste Advisory Board blessed a sub-committee called Spruce Up Kodiak. 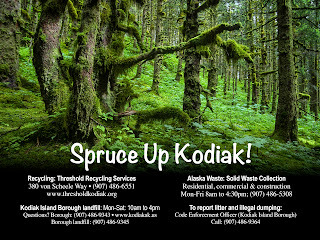 Co-chaired by Marion Owen and Cindy Harrington, the committee launched the campaign with three new posters, radio PSA's (public service announcements) and a series of new classified ads in the Kodiak Daily Mirror. "The posters will be made into post-card size refrigerator magnets," says Marion. 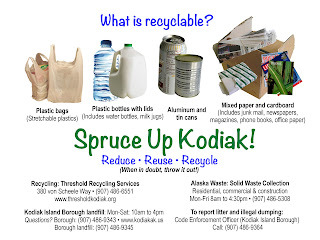 "The first one gets right to the message, which is what you can recycle in Kodiak. 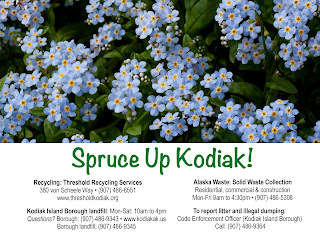 The other two are scenes of Kodiak with contact information to help direct people to help with answering the question, "what do I do with...?" 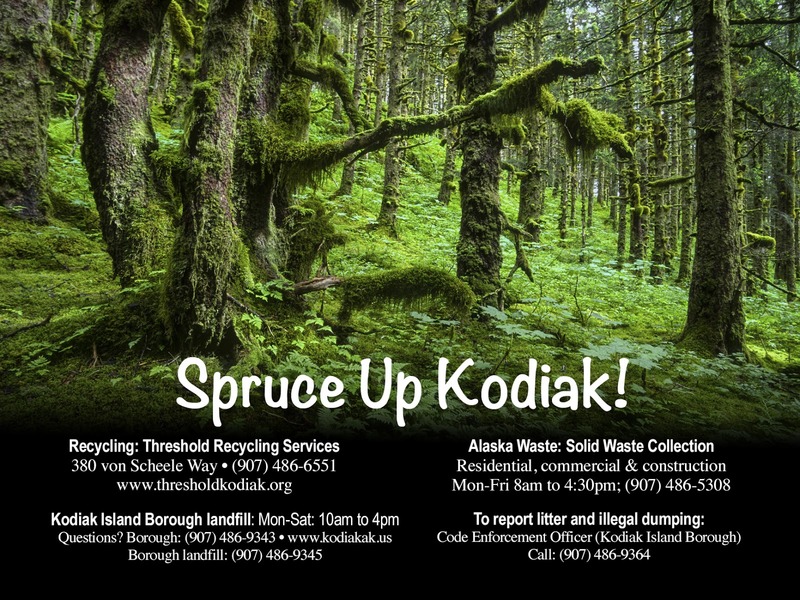 "We've only just begun and we invite anyone interested in litter, recycling, garbage and beautifying Kodiak to get involved!" How does 30 years of persistence sound to you? 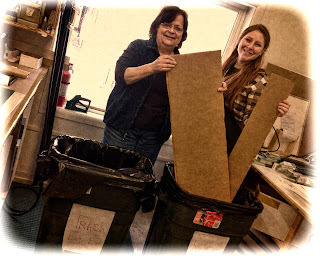 Janet Wente (L, with help from Rachel Organ, R) of Northern Exposure Gallery in Kodiak has practiced the 4R's (Reduce, Reuse, Recycle and Rethink) since 1983. Gives away mat board to all schools, day care centers and summer programs. Recycles and re-uses all cardboard and metal clips from incoming orders of supplies. Janet practices pre-cycling, too. 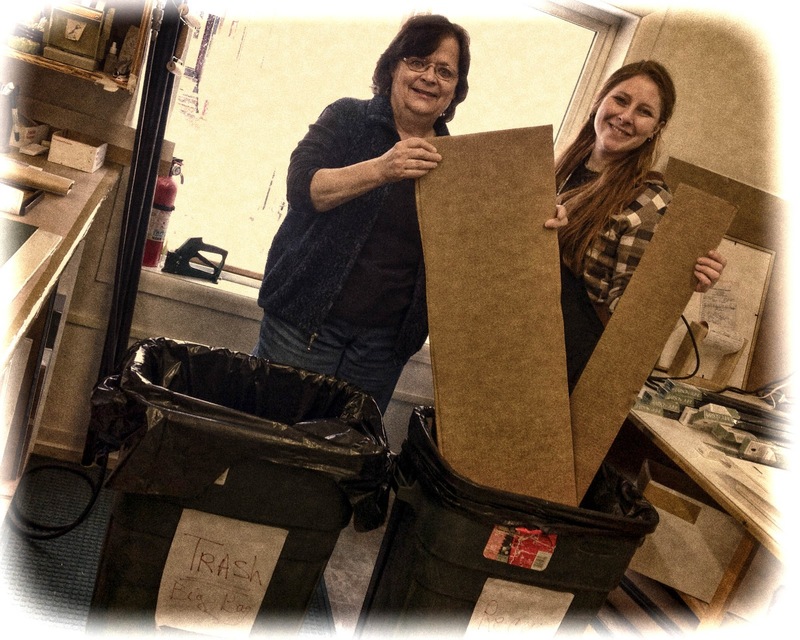 "Before I take something to Threshold Recycling Services, I stop and ask myself, 'is there another use for this material?'" Janet adds, "I think all businesses should consider pre-cycling." According to the USDA's Natural Resources Conservation Service (NRCS) office in Kenai, as of March 2013, Kodiak Island has 55 hoophouses (counting the 8 contracts approved this year, FY 2013). These hoophouses, also called high tunnels, are affectionately known as "hope houses" because they provide gardeners and growers an "edge" against the fickle coastal weather that can make or break a growing season. As one gardener said, "When it's pouring rain and blowing outside, I love to go into my hoophouse to see all my vegetables standing tall, pretty and protected." Where do these hoophouses come from? In a nutshell, they're part of a USDA program called the Seasonal High Tunnel Initiative. This is a "voluntary program that provides financial and technical assistance to agricultural producers. The goal of the initiative is to assist producers to extend the growing season for high value crops in an environmentally safe manner." For basic information about the program, visit the 2013 EQIP Seasonal High Tunnel Initiative page or contact Craig Sanders in Homer at 907-235-8177, ext 107. 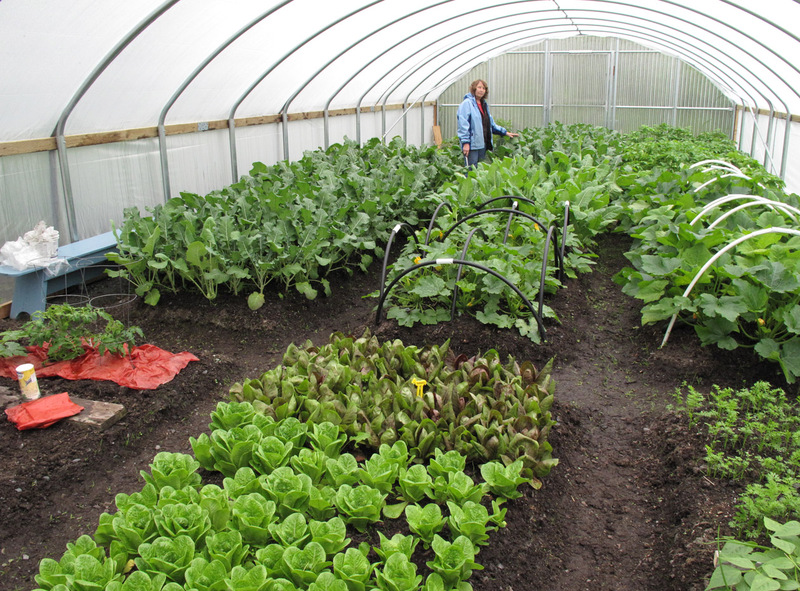 To apply for a hoophouse: Applications are available at the local NRCS/KSWCD office in Kodiak. While this office is not staffed by NRCS, the Kodiak Soil and Water Conservation District (KSWCD) uses their office and can provide you with hoophouse applications. TIP: But you should call Craig in Homer for most NRCS details. Craig can request the KSWCD to do local on-the-ground inspections for him if needed. The KSWCD number is 907-486-5574. Marie Rice stands near a raised bed of broccoli in her hoophouse in Bells Flats. Please join the Kodiak College teaching community to explore Difficult Dialogs and Sustainability with UAA CAFÉ’s Associate Director Libby Roderick on February 23! RSVP by February 18 to reserve your spot, (907) 486-1215. If you want to connect your own renewable energy generator to KEA's power grid, now you can get buy-back credits. 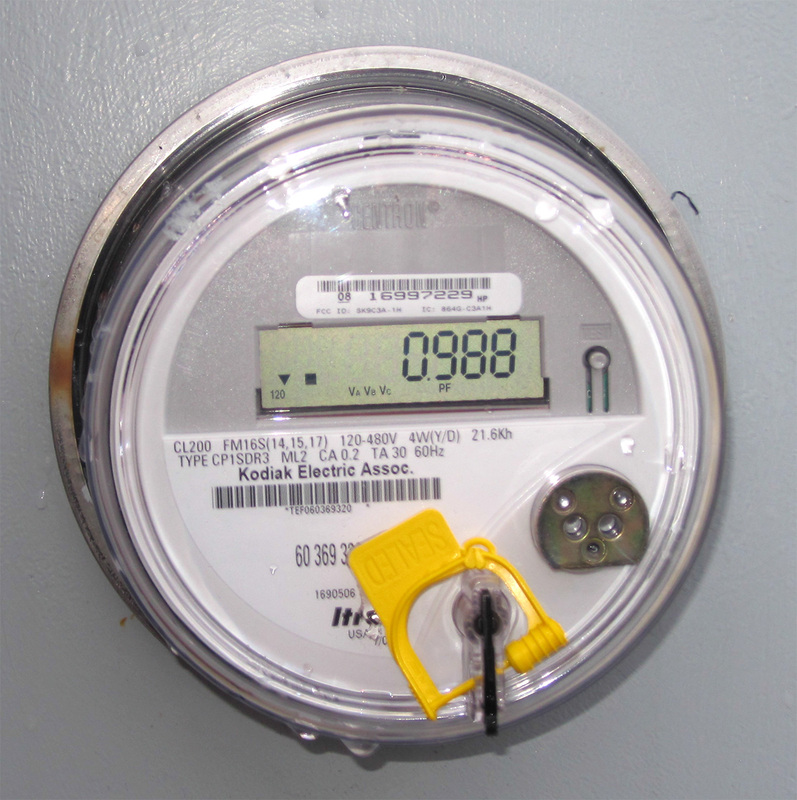 Starting January 1, 2013, KEA's revised Rules and Regulations for Electric Service and Rate Schedules accommodate heat pumps and net metering. For some folks, this can be a little confusing. "Something we want to make sure people understand with net metering is that installing a residential-scale wind or solar installation can be expensive," says Jennifer Richcreek, "and the buy-back rate for excess power put onto the grid is based on KEA's diesel use. So the less diesel KEA uses, the less the buy-back rate for the resident generating their own renewable power." 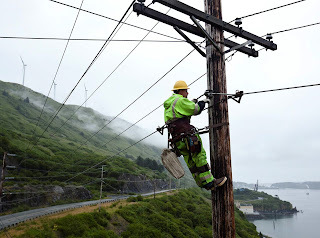 If you have questions about the new policy, contact the Kodiak Electric Association. Many articles can be found on the KEA e-news website. KEA has added a new residential 400-amp service rate to accommodate electric heat service to larger homes. According to Jennifer, "As KEA does a better job supplying electricity at affordable stable rates, there's a growing interest in the community with converting home heating systems over from oil to electricity." This is a great improvement. If you had standard 100 or 200-amp service, you had to install multiple meters. "This new policy allows more power to be supplied to a residence through a single, more powerful meter. This new service rate is not exclusive to heat, but electric heat would be the type of load that would typically require more power." How much electricity comes from wind, hydro and diesel? In 2012, 95.7 percent of KEA's generation portfolio, as it's called, came from renewable resources. You can follow KEA's progress on the KEA website. 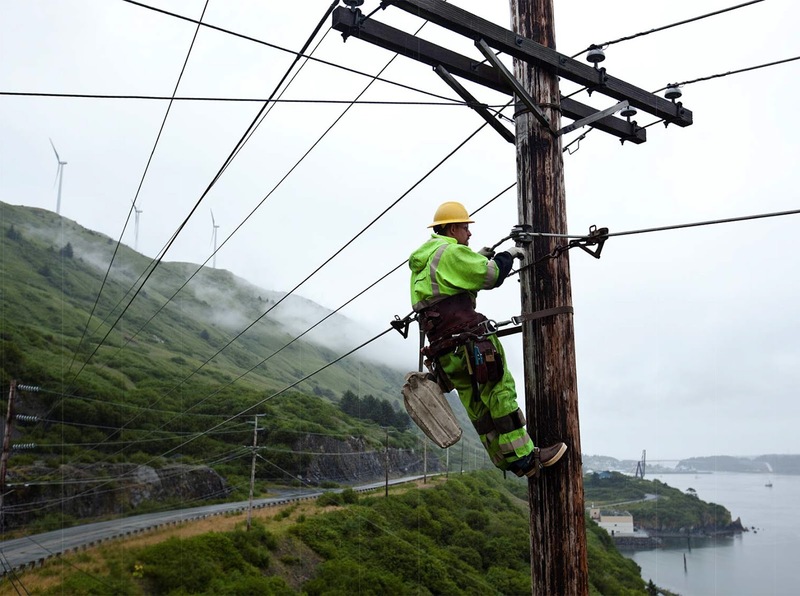 ON SUNDAY APRIL 22, 2012, TUNE INTO KUAC’s AlaskaOne service Or KAKM, YOUR LOCAL PBS STATIONS FOR THE PREMIERE OF ENERGY QUEST USA AND POWERING THE PLANET. Gather your friends and family for two new installments of EARTH: THE OPERATORS’ MANUAL, the acclaimed PBS documentary series on climate change and sustainable energy. Meet people who are energizing America by rolling up their sleeves and taking control of their energy future. ENERGY QUEST USA (4/22 3pm on KUAC & 4/30 8pm on KAKM) visits five very different American communities from Alaska to Fort Worth, Texas to the East Coast where people are making smart choices based on economics and the environment. Their experiences chart a path every U.S. community can follow to adapt to the challenges climate change may bring. POWERING THE PLANET (KUAC WORLD 4/27/12 at 2,5 & 10pm & KAKM 4/26 8pm) takes an eye-opening look at some of the world’s most important case studies in energy policy. Brazil has sugar cane. Denmark has wind. Morocco has sunshine. China has plans. And America has… politics and indecision. Using compelling stories that showcase the many ways in which great nations and smaller communities are finding sustainable solutions, this program asks an urgent question: is America making the right decisions for its own energy future? EARTH: THE OPERATORS’ MANUAL is supported by a grant from the National Science Foundation (NSF) and produced by Passport to Knowledge/Geoff Haines-Stiles Productions, Inc.